The foam roller was my best friend today. We have a really nice relationship with one another, even though it put me through hell at the beginning. Just like any normal relationship, right? Not. 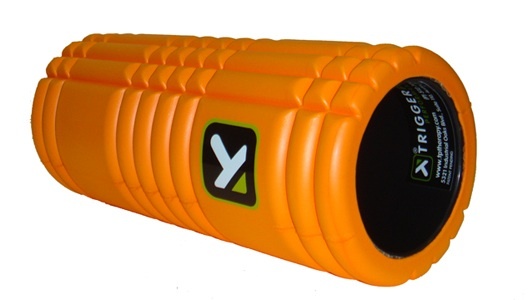 "The Grid" foam roller. That's not me on it, obviously. I look far less graceful that this girl. I decided to take advantage of this beautiful Sunday by spending lots of time taking care of my IT Band Syndrome by stretching, strengthening, rolling, and working out. I even took a nice 15 minute ice bath tonight to decrease any inflammation after I spent some time at the gym (Thanks Claire@ Let's Go on a Living Spree for the suggestion!). I feel like the bath ices the entire IT Band, which a typical ice pack can't do. Plus you stay cold for a while.... I'm still defrosting from my ice bath. 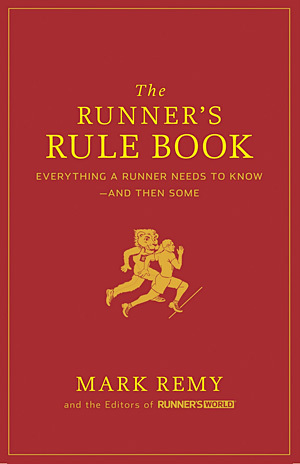 So since I am still not running I decided to share some running wisdom from The Runner's Rule Book by Mark Remy. Its a great little book that has little tid-bits of information for runners. Plus its super funny and always gives me a good laugh. I would definitely recommend reading it and adding it to your running book collection, especially since its pretty cheap on Amazon (~$12). 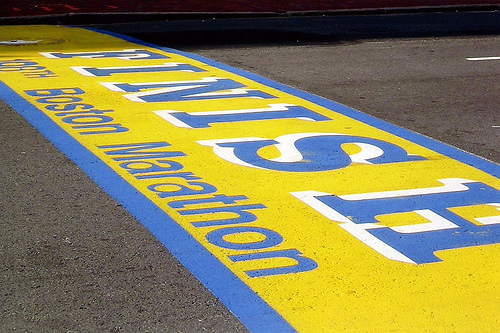 A race--weeks or months away--is the proverbial carrot, dangled out there for you to pursue. Even if you don't plan to really race your race (in the "run till you feel like puking" sense), registering for an event that is 6 or 10 or 26 weeks down the road remains the single most foolproof way to motivate yourself to get out there and run day after day. ...Nothing can replace the printed-out training plan stuck to the refrigerator... So put the plan on the fridge. Remove a child's artwork to make room, if need be. We won't judge. Because being outkicked by Elmo is too much to bear. Wearing the official race shirt during the race is like wearing a U2 t shirt to a U2 concert. Not cool. Don't do it. 17. Whenever possible, begin and out-and-back run into the wind. 31. A long-sleeve shirt and shorts will always look better than a short-sleeved shirt with tights. 37. No one sleeps well the night before the race; the night before the night before your race is the important one. 51. If you even care a little bit about being called a jogger versus a runner... you're a runner. Those are just a few examples of what's in the book. I definitely recommend getting this one, its a fun and light read! Plus, if you are a new runner there's some good running tips in there. Anyway, spring break is over for me and its back to the grind tomorrow! Have you read any good running books lately? Got any good tips for fellow runners? What were your workouts this weekend? 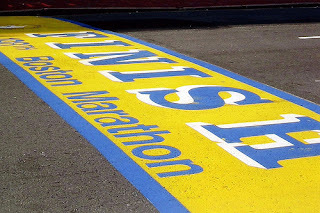 Anyone running or watching Boston?! Oh! I just got "Runner's World Run Less Run Faster" in the mail about 10 minutes ago. I am pumped!! I think it is a jinx to wear the race shirt during the race!! Awesome!! Actually, I've had my eye on that one, too so let me know how you like it :) I'd love a new running book! I definitely agree about writing things down because I feel like it makes you more accountable for your runs. I put my NYC Half training plan on the fridge and it made a huge difference! Everytime I thought about going to get ice cream, I saw the plan and immediately shut the fridge haha. Also, those rules are totally true!! Thanks Claire :) I hope they help too. So far, I feel as if I'm getting better but we'll see when I try to run again in about 2 weeks or so! !